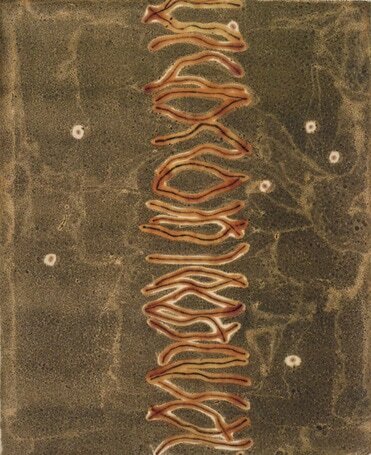 ​The Savored Line developed from my interest in textile design enhanced by natural fibers and pigments. I utilize digital technology in my studio practice, and have made solely digital works in the past, but I am always drawn back to historical references and processes of art, craft and making. Over the past several years I have been tinting materials with pigments from walnut ink, indigo and madder root, in a process where I can manage mixtures and concentrations. Texture, color, and line, are prominent elements in this series monotypes that are a single and unique one-of-a-kind print. What I enjoy about working with heated bees wax and pigment is the confluence between painting, drawing and printmaking. I can brush the liquid color onto the plate, draw and mark on the surface and transfer the image to paper where the color seeps and absorbs into the surface fibers.